SEASON ONE: The British Empire is in decline, the political world is in disarray and a young woman takes the throne...a new era is dawning. Queen Elizabeth II is a 25-year-old newlywed faced with the daunting prospect of leading the world's most famous monarchy while forging a relationship with legendary Prime Minister Sir Winston Churchill. 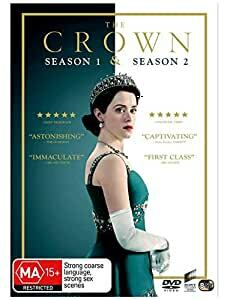 SEASON TWO: Follow Queen Elizabeth through the late 1950's and early '60's as she struggles to navigate a world that's changing around her. She must face the challenges of a new era, from the Suez Canal crisis to the assassination of John F. Kennedy, while preserving both the monarchy and her marriage. I sent this set to my mum and the DVDs do not work or play. I have ordered DVDs before and not had an issue. Unfortunately I did not know that Blu Ray DVDs can only be played on Blu Ray players and not everyone has one. The annotation that it is REGION FREE is misleading. This needs to be spelt out in large letters in the marketing materials.